This particular photo one Sunday made this week in August a very special one for my baby girl. Her father came home and was with us for 19 hours. We attended his youngest nephew's Catholic baptism. Well, we just went straight to the reception since none of us, Cpt R and I, were godparents. My SiL ordered cupcakes from me, too. So I found it practical to just skip the church and deliver the cuppies to the restaurant. Pia wore her dress from Kiara Shoppe that matched mine. It got so many likes from you when I posted it on the page. 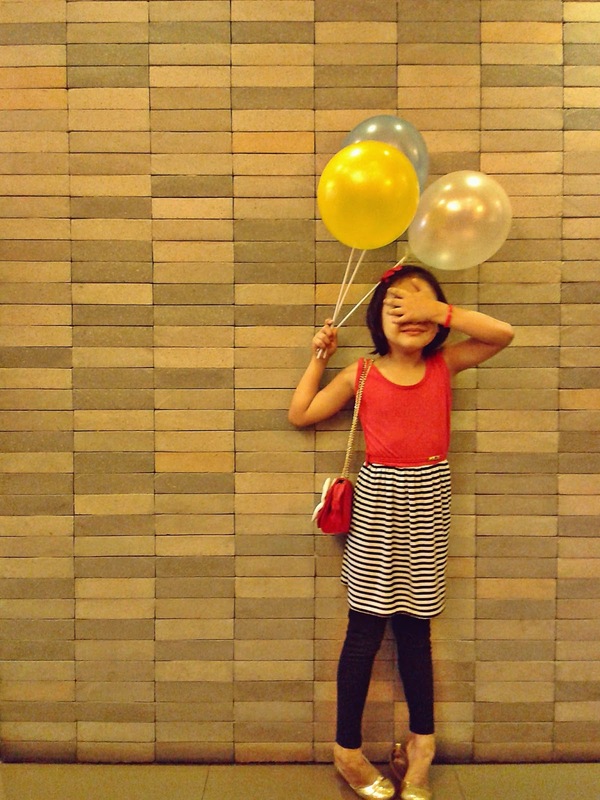 So if you're into wearing matchy-matchy with your little ladies, too, go and get a pair (or pairs) of dress from Kiara Shoppe! Back to the photo. Found this wall outside the function room in Max's in Blue Wave Mall, Marikina. While most of the guests were lining up for the photo booth, which we already did when all of them were busily eating (hihi), we had our own photo sesh outside. I don't know what's with this girl that day. She just kept on doing that pose with her face and hand! If we're friends on Facebook (not the page, the personal account), she also had her hand covering half of her face on one of our family photos. So crazy! But cute, still. Yes, she hoarded balloons. That's her "party" thing. She's growing up way too fast! I really should not blink.